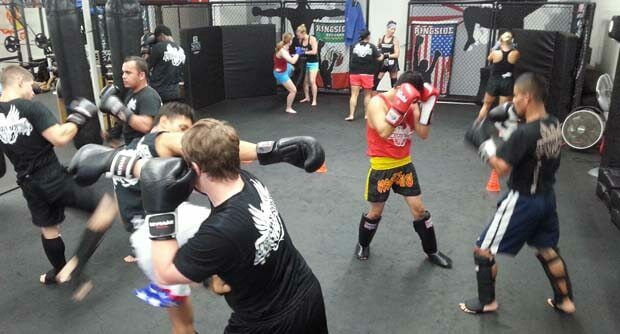 If you are looking for a legit Muay Thai Gym in San Diego, you’re at the right place. American Boxing coaches and krus are not only highly experienced fighters and trainers but are COMMITTED to teaching PROPER MUAY THAI TECHNIQUE and TRADITION to each and every student! Limiting class sizes to 12 or fewer students allows us to offer the highest quality of instruction. Noone else caps their classes! Our school offers San Diego Men, Women and Kids a clean and safe environment to work towards fitness, self-defense and fight competition goals. When utilized properly, the Muay Thai philosophy goes, “A 100 pound woman can knock out a 200 pound man with proper Muay Thai technique”. That is American Boxing Muay Thai! Another benefit of Training Muay Thai at American Boxing is our perfect 1.5 mile jog to the Pacific Ocean. This American Boxing Muay Thai class is an introduction to the art of 8 limbs. A superior fitness tool, highly effective self defense, martial art, as well as amateur and professional sport makes Muay Thai an amazing hobby, suitable for men, women and children of all ages and all fitness levels! Stay safe by learning proper fundamentals of traditional muay thai style kickboxing and see why Thai Boxers, among other advantages, have the best cardiovascular conditioning and of course abs in the sports world! CLASS PREREQUISITES: No experience is necessary. No direct contact is necessary. Coed Classes. Try a class today! This is also a coed Muay Thai class with both guys and girls training for fitness, sport and self defense. Yes, at American Boxing we all work together to be better! This class will approach Muay Thai from the Team Nielsen American Boxing approach and philosophy of no-nonsense, powerful and highly effective combinations, setups and striking techniques, refined and effectively proven by Coach Dave and Team Nielsen fighters consistently over the past decade! Learning effective defense and counters used by Professional Muay Thai fighter, current WBC Muay Thai National Champion and 7X Muay Thai Champion Coach/Kru Dave Nielsen. CLASS PREREQUISITES: Muay Thai 101 or a 30 minute private lesson and as always, a humble attitude! A minimum of 1 solid year of legitimate Muay Thai training is required. You will be evaluated in the Muay Thai 101 setting or with a private session with Coach Dave.